Brandon Waugh is the perfect example of the effects of hard work and dedication. Waugh enjoys wrestling, and all of his efforts have paid off. 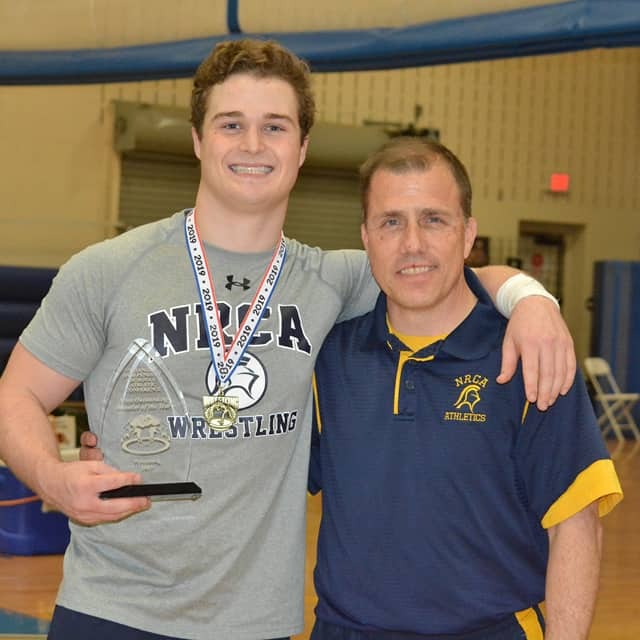 Waugh was awarded TISAC Wrestler of the Year and won champion in his weight class. In order to achieve this, Waugh has put a lot of time and effort to wrestling over the past five years. “I have been wrestling since the eighth grade, so this is my fifth year on the team,” Waugh said. Waugh began his wrestling journey in the eighth grade through his passion for football. His football coach encouraged him to start wrestling in order to stay in shape. “Football is my true passion, and every coach and mentor I talked to said that wrestling was the best thing I could physically do to prepare over the offseason. Also at that time, a lot of my best friends were wrestling and it created a fun environment to learn the sport. At this point in my life, it has become so much more than just preparing for football. I have come to love the sport, even though most of my friends did not continue, and I am on track to win states this year,” Waugh said. Preparing for both football and wrestling requires excellence to have the best performance. Waugh puts so much time and preparation into his performance, both on and off the wrestling mat. “Winning is not accomplished on the mat. It is accomplished by weeks and weeks of training. This includes things like dieting, conditioning, and tons of practice. During the week, I am constantly having to watch what I eat so that I can keep my weight in check in order to maximize every bit of my body mass. I make sure to workout and condition every day, even before I have my actual practice. All this dedication creates habits for me that ensure I am in the best physical shape that I can be in. I will not always be the biggest guy out there, but what I can control is the fact that no one will ever outwork or outplay me,” Waugh said. This hard work and dedication physically led Waugh to where he is today, but his mental preparation came from his coach, Jon Mitchell. “The best part of the sport by far is my coach. Sure I love slamming people and testing my strength and endurance, but honestly the thing that always kept me going is Coach Mitchell. He has been like a second father to me ever since I joined the team. I have been playing sports ever since I could walk, but he is by far the best coach and mentor that I have ever had the pleasure of playing for,” Waugh said. This mental and physical preparation and strength led Waugh to be the wrestler he is today, and it will hopefully lead him to win the state championship this year.